How do I create Domain Metadata fields? 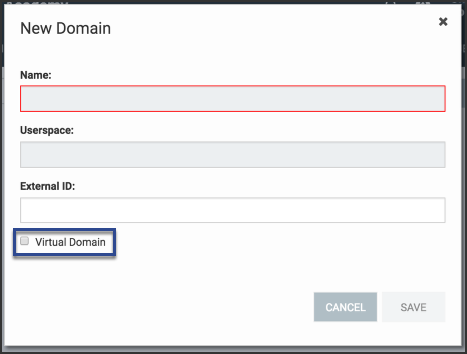 Create metadata fields that allow you to record and track additional information about a domain. Click Add on the Metadata for domain card. Name: This names the field behind-the-scenes and is not visible to the users. Title: This appears wherever the metadata appears for users to complete. Input Type: This specifies how you want users to provide the metadata. Placeholder Text: This is what you want to appear in the field when left blank; you can use this to provide directions and or example content to help users complete the field. 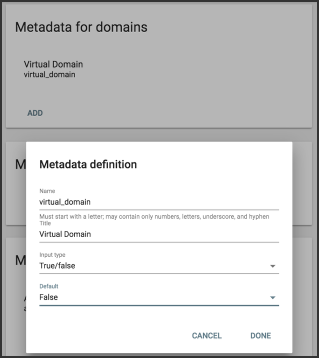 Default: This defines the state or content that you want present in the field when users first encounter it and is recorded and treated as metadata if it isn't changed (you may want a True/false field to record False unless changed by a user, for example). Click Done and Save Domain Settings. Once created, the Domain Metadata field appears on the Create Subdomain screen. How do I create Question Metadata fields? Can the metadata fields be used to add user information (i.e., grade level) which we could then request in custom reports? Is there another way to display/include grade level in reports on user activity that you can recommend? In the Domain Settings under the User Options tab there is a section to create custom User Metadata fields for this purpose. The added custom fields would then be able to be modified for users in the user Edit page and will display the content on the User Data tab of the user as well. This data could then be referenced in custom reports to query for the custom metadata with an example following. The returned information could then be used for further reports as desired. How do I add observers to an enrollment?